Ideal for educational settings, youth centres, detention centres, institutional and industrial applications, and gymnasiums. 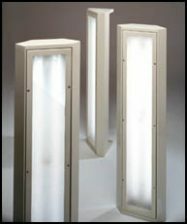 Standard electronic ballast, two fluorescent lights and a retrofit kit for easy transformation from a ceiling light to a corner light. Incandescent lamp for transformation to emergency lighting. Tamper resistant casing and screws. The 16 gauge beige powder coated metal welded box meets safety and security standards.